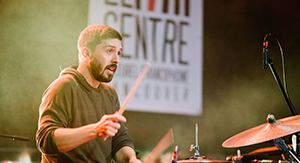 As one of its principal activities, Le Centre offers professional cultural events in the fields of visual arts, media arts and performing arts to metro Vancouver's population. Le Centre organizes three major festivals dedicated to the Francophone culture: the “Festival d’été francophone de Vancouver” (Vancouver Francophone Summer Festival), which happens in June, the Coup de coeur francophone de Vancouver which, every month of November, links Vancouver with other cities in Canada on the Francophone music scene and the Vancouver's annual Francophone comedy event which happens in the Winter. A 6,000-books library and many hundreds of movies, including the French collection of the National Film Board of Canada. Philosophers' café, Francophone book club, beach volleyball, storytelling for children and an evening of discussion in French every Wednesdays.